I made this one for the duelist-chronicle group wallpaper contest. And yes....it's the same dark magician girl XD~!!!! -masks of vector...(you don't wanna now....because I did it in a wrong way XD): 1278 masks XD~!! Wtf? That's some BIG improvement on the last wallpapers I've seen. Hoo-boy. wow, the background is so good. Really nice and also the picture. Nice. Oh wowies! This is very nice! I like the trees! It's so pretty! And I like the whole concept! It's like oil painting! Great vectoring! I can't vector, so kudos to you! Great work meteorcloud! Keep it up! rofl... XD okay this is getting kind of sad. 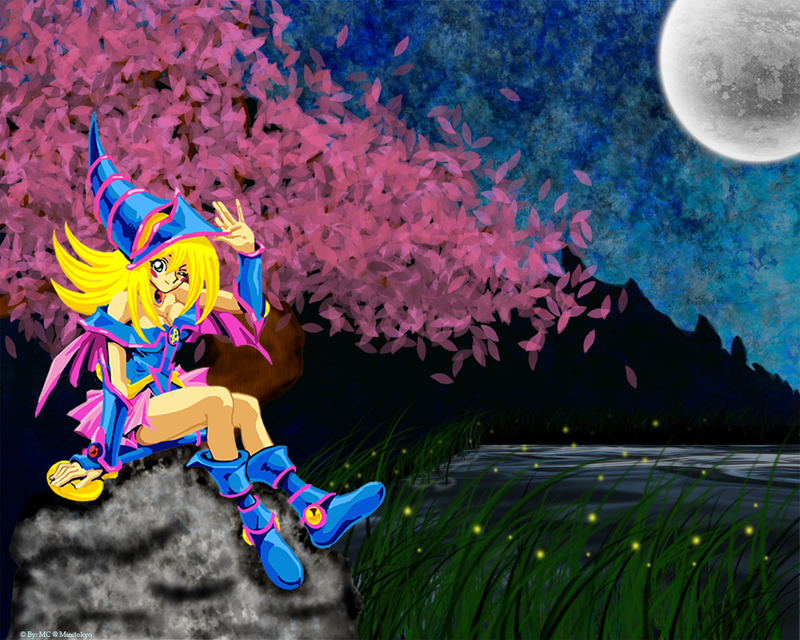 wheeeeeeeeeeee dark magician girl! Ahem! 1278 masks O_O whoa that's alot! Anyway this is a good wallpaper! Great job. Its nice and cute though i make my eyes like tis! (+_+) Shining too bright! Hehe! Gd work anyway! woah!! this wall is so beautiful!!! this is gonna be my fav!! That's a long time to spend making a wallie, but it looks to have paid of nicely. Great work ^___^ . XD great work! I think the tree in the back is realy beautiful, the type of leaves give it a nice touch. I think the water looks nice too. Only think the girl is alittle to bright for this bit darky background. still well done. Quote by athrunWtf? That's some BIG improvement on the last wallpapers I've seen. Hoo-boy.